Tim (he was a tall man and Tim was a contraction from his nick name "Tiny Tim") Hogg was borne in Launceston, Tasmania on 11 June 1906. Following secondary school he studied to be a doctor and graduated in 1931. He later travelled to Edinburgh University to continue his studies. Whilst there he attained Fellowship of the Royal College of Surgeons (FRCS) and Post War he attained Fellowship (FRACS) in Australia (see end of article). Captain Hogg was one of eight Australian Medical Officers who were sent to Thailand as members of K and L Force. These two forces were tasked to keep the Japanese Coolie labourers, numbering around 250,000, alive. This was an impossible task and it is estimated that around 90,000 of the coolies died. I am grateful to Mrs Jenny Blencowe and Mrs Susanna Allen, the late Tim Hogg's daughters, who have given me permission to publish the following extract of 20 pages from a family history titled "An Early Tasmanian Story". Tim Hogg had been a cadet at Geelong College and later was a member of the Melbourne University Regiment (M.U.R.) when he was a medical student at the University, graduating M.B.B_S. in 1931. In May 1939, whilst he was at the Launceston General Hospital, he had been made an "Honorary Captain", in the Army Reserve. Tim remained as an Outpatients Honorary Surgeon in the Launceston General Hospital until 1 August 1941 when he enlisted in the Australian Army with the rank of Captain. With the commencement of the Second World War in September 1939, Australia formed three army divisions, the 6th, 7th and 9th, which were sent to the Middle East for fighting in the Western Desert, Palestine and Syria. The 8th Division was formed at the end of 1940 but was not fully trained or equipped, and had no combat experience. By early 1941, the allied forces were very much on the defensive and the military forces available in the Far East had not been strengthened and had effectively been run down. In a general strategic assessment of the Far East in early 1941 it was realised that the Far East and the South West Pacific areas were critical to the defence of Australia and that there were inadequate military forces to meet the situation. The recently formed 8th Division was assigned to Malaya and elements of the Division left Sydney in early February 1941, including a number of medical units. The medical units, as such, were well organised with a structure which included Casualty Clearing Stations, Field Ambulances, Field Hygiene units, Convalescent Depots and a full General Hospital. 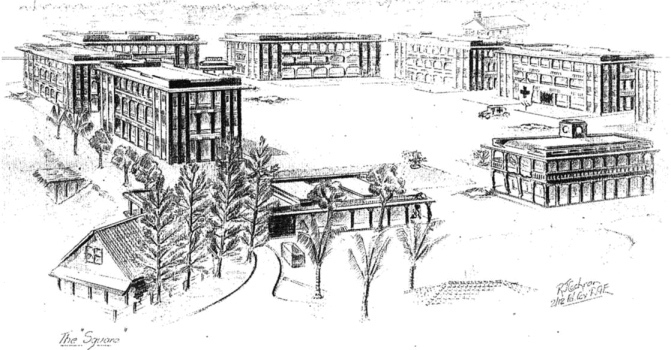 The general hospital included all normal facilities such as doctors, nurses, dentists, surgeons, X-Ray units, pathologists together with a large range of medical stores. The Australian General Hospital (A.G.H.) which was initially set up with the 8th Division in Malaya was designated 10 A.G.H.. This general hospital was adequate for the initial 8th Division units deployed, however it was not adequate in size for the full division when it was fully deployed; accordingly a further general hospital was raised and equipped in Australia in mid 1941, this was designated 13 A.G.H. This was the unit to which Tim Hogg was assigned. He departed from Melbourne on the H.M.A H.S. Wanganella on 2 September 1941 and arrived in Singapore on 17 September. As 13 A.G.H. was a new unit and inexperienced in the tropical conditions of Singapore and Malaya, there was an interchange of staff between the existing 10 A.G.H. and 13 A.G.H. and 13 A.G.H. was then commanded by a member of 10 A.G.H. The hospital was originally sited at St. Patrick's School on Singapore Island, to the east of Singapore city, but with the final allocation of the responsibility of the 8th Division to the defence of Johore and Malacca in the southern part of the Malay Peninsula, the hospital moved from Singapore Island to Tampoi, seven miles from Johore Bahru in a partly completed mental hospital on 8 December 1941, the day after the Japanese attacked Pearl Harbour and simultaneously attacked the northern Malay Peninsula. The 10 A.G.H. was sited further north at Malacca in part of the Malacca hospital. By early January with the rapid Japanese advance down the Malay Peninsula and the Australian forces becoming heavily engaged, the 10 A.G.H. was forced to withdraw to Singapore Island. The 13 A.G.H. was itself forced to withdraw to Singapore Island by the end of January, this involved the immense task of moving a fully equipped general hospital with 1,200 beds; the site of the hospital was taken over by a Casualty Clearing Station and it appears that Tim Hogg remained behind with the Casualty Clearing Station to attend the wounded soldiers. The Casualty Clearing Station was the last of the medical units to withdraw to Singapore Island and Tim was one of the last to cross over the causeway from Jahore to Singapore Island before it was blown up. The 13 A.G.H. was relocated to the St. Patrick's School where the work load was extremely heavy with a very large number of battle casualties. Tim, as part of the surgical staff worked from 8 P.M. to 8 A.M. in one of four hastily set up operating theatres, each with two operating tables and two surgeons to each table. The conditions of working he described as a "very hot and stuffy atmosphere". Up to this time there were a large number of female nursing staff in the hospitals, these were withdrawn and all evacuated from Singapore by 14 February, this loss of experienced nursing staff placed a great strain on the hospital as they had to be replaced with relatively inexperienced male staff. The Japanese invaded Singapore Island and there were heavy air attacks on military installations. The Island's water supply came principally from Jahore across the Causeway and this was cut off, causing significant problems in the hospitals. The Japanese advance caused many further battle casualties, and eventually the St. Patrick's School hospital site ended up in "No Mans Land" with artillery firing from both sides over the hospital. The firing suddenly stopped and it was realised the Allied forces on the Island had surrendered. Captain Tim Hogg became a Prisoner of War on 15 February 1942 along with 15,000 other Australians. At the time of the surrender, the status of various personnel in the various Australian units was obviously uncertain, as the Central Army Records Office was not informed whether he was a prisoner of war, so that after the surrender Tim Hogg was recorded as missing in his military record, dating from 16 February 1942, his Next of Kin were notified on 19 April that he was "Missing presumed dead". Normally, the International Red Cross would have obtained the names of all Prisoners of War from the Japanese command and duly notified the Australian authorities. It was not until 7 January 1943 that the information that he was a Prisoner of War finally reached Australia, that he was "interned Malayan Camp". In this intervening period his daughter Jenny, who was nearly five years old at the time, remembers that she really believed that they could dig through the earth and reach him on the other side; she also told imaginary stories to her brother and sister that he was coming home. With the surrender, the Japanese kept the allied force structure intact, with all the usual military command structure functioning; effectively, the only major change was the removal of the higher level general staff officers to Japan. The Japanese forces proved quite unpredictable, and the Australian hospital staff were very worried after the Japanese forces stormed the British military Alexandra Hospital killing most of the staff and patients. 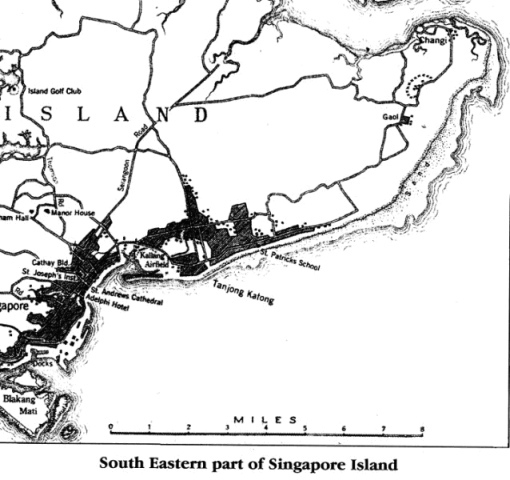 Within days after the capitulation, the Japanese ordered that all sick and wounded on Singapore Island (9.000 in all) were to be moved to Changi on the eastern tip of the Island, the Australians being allocated the Selarang Barracks area. Only a week had been allocated for this move, with virtually no transport. Eventually, this was strung out to three weeks, but still the problems of the move were immense and the Japanese tried to restrict the move of medical equipment and supplies. Within weeks, the Japanese ordered that all the prisoners' hospitals were to be combined together as a common hospital in a separate location in the Changi area, called the Roberts Barracks. This move and the creation of a common hospital caused many difficulties but this was eventually overcome. Sanitation proved a major problem as the hospitals had great difficulty in maintaining adequate water supplies and the general soldier camps had little in the way of sanitation and washing facilities. This took many months before it was brought under adequate control, meanwhile dysentery and similar sanitation diseases became a significant problem. This came to a head in late August 1942 when, following the attempted escape of some prisoners, (who were subsequently executed) the Japanese demanded that all troops should sign an undertaking that they would not escape. This naturally caused much disturbance among all prisoners and acting on command instructions, they all refused to sign the undertaking. The Japanese response was to move all the troops to the Selarang Square, where there were three building floors and an area of 800 by 400 feet. Tim Hogg well remembered this incident and the appalling sanitation problems from the confinement of over 15,000 troops in such a small space. Diphtheria and dysentery broke out, and the Japanese threatened to halve the rations of the troops. Eventually, a compromise was worked out and a carefully reworded document produced which enabled the Japanese to save face, and the prisoners were told by their officers to sign under duress. As soon as the forces moved to the Changi area both preventative and curative medicine assumed the greatest importance. The magnitude of the obvious task of the medical services, that of curing the sick was subject to more than usual fluctuations. These were owing, in the first place, to the number of casualties from combat and disease that represented a legacy from the Singapore battle. Next there was a rise in illness due to infective and nutritional causes, arising within the concentration area itself. This varied from time to time, partly owing to the upsurge and subsidence of ordinary and prevalent or epidemic diseases, some of which was preventable. 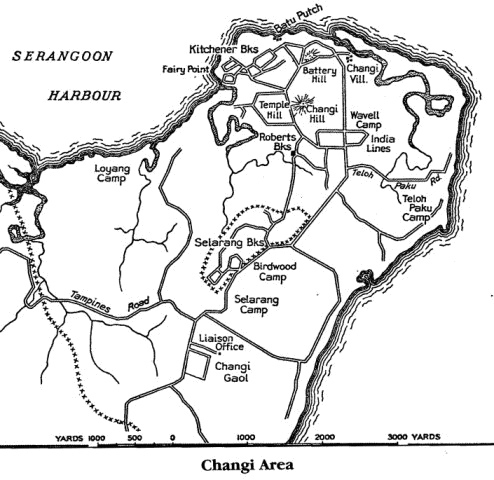 During the first months, the commonest diseases in Changi were disorders of the skin, dysentery, other digestive troubles, and to a lesser extent respiratory diseases. Typhus and malaria mostly contracted before capitulation were also seen in hospital and diphtheria appeared, though in fewer numbers in the A.I.F. than in the British force. Another reason for the rise and fall in illness was related to the nutrition of the men; malnutrition was a constant menace throughout the whole force, and varied in degree with the ration supplied and the supplements that could be procured or devised. Finally, the amount and to some extent the type of illness occurring in Changi depended upon the military population itself, which fluctuated considerably. All prisoners, whatever their rank, were regarded by the Japanese as labourers and were used as such for various work around Singapore. Tim Hogg was not immune from this work and spent a considerable amount of time unloading ships and other related work. This did however have some consolation as there was always the opportunity for scrounging additional food or other items. They managed to sell some items, such as rolls of silk to the local Singapore people, but they always had to be very careful. Tim felt that life in Changi, was not too bad; there was an organised social life, with lectures by the large number of experts in virtually every field including artists, lawyers, eye specialists, nutrition experts etc. One artist prisoner specialised in making miniature playing cards which were decorated by the artist; the Queens of Hearts and Diamonds were glorious blondes, the other cards were appropriately decorated. Tim had a set of these cards throughout his entire imprisonment, but threw them away at the end as they were so dirty and worn out. In March 1942, the Japanese began to send out working parties into different parts of Singapore Island and the neighbouring mainland and in May, a series of overseas and up country working parties were sent away. These varied in size from small parties to large forces of several thousand; some returned after a time, others, bound for more distant destinations never returned. o Thailand D, F, H Forces and K and L Forces (medical forces). o Japan C, G and J Forces; Senior Officers Party. o Borneo B and E Forces. o Manchuria, Indochina, Formosa and Korea. In addition a Force called Dunlop Force went to Thailand from Java. After the Japanese over-ran Thailand, Indo China, Malaya and Indonesia, they continued their strong movement to the south and in addition, they mounted a major attack on Burma and from Burma they intended to over-run India. They had a major supply problem in their assault on Burma and India as they desirably wanted to avoid the long sea route around the Malay Peninsula. The best port facilities were at Bangkok but there was no suitable road or rail route through the mountains into Burma. The Japanese felt that they could construct a railway, given that they had a cheap labour force available, in the form of the prisoners in Changi and other locations. This route could then link up with the existing railway which ran from Singapore to Bangkok and also with the railway systems which ran the full length of Burma. The route of this new railway ran from Bangkok on the east bank of the Mae Khlong River16 until it reached the Kwae Noi River, it then crossed the Mae Khlong and followed the east bank of the Khwae Noi into the mountains to the north west and cross the mountains at Three Pagoda Pass. It then followed down into Burma through the mountains to Thanbyuzayat. The presence of the rivers enabled an easy supply route for the work forces which were established at various camps along the route of the railway. The proposed railway was 270 miles long and ran through dense uncleared forest for most of the way, with many deep cuttings and embankments and about 700 bridges. In May 1942, the first Australians left Changi to work on the line, these were designated A Force, they went by ship (often called Hell Ship) to Burma for work on the railway. It was not until January 1943 that Australian units were moved to Thailand for work on the railway, the first to arrive was Dunlop Force, which was commanded by Weary Dunlop; this force came from Java and the experiences of this force are graphically told by Weary Dunlop in his published diaries. Later Australian forces then left Changi for work on the railway. It would not be appropriate here to go into detail on most of these construction Forces, sufficient to say that they worked under the most appalling conditions, with Japanese construction supervisors who had only one requirement - to complete the railway in time for a Japanese offensive in Burma; the welfare and life of the construction workers was of minor or no importance. Malnutrition was a way of life, exhaustion and tropical diseases were endemic and the loss of life very great. In all, approximately 62,000 British, Dutch and Australians worked on the railway in the various camps, of these there were over 12,000 deaths, about 20%. By March 1943, it became apparent to the Japanese that they would need many more labourers to work on the railway construction and they commenced advertising in the Malayan newspapers for coolies to work for periods of three months in Thailand. Free rail travel, housing, food and medical services were said to be provided and the pay offered was a dollar a day. Few coolies responded to these advertisements so the Japanese resorted to "Press Gang" methods, with armed Japanese visiting each kampong or village and demanded at least 50% of the male population. The promised three months contracts were worthless and no coolies returned to their homes in the first 18 months. The total number of coolies actually moved to Thailand is uncertain; the numbers were estimated as at least 250,000. Of these coolies the Japanese admitted to 90,000 deaths; Australian medical staff who worked closely with the coolies place the figure for deaths up to December 1944 between 150,000 and 200,000. 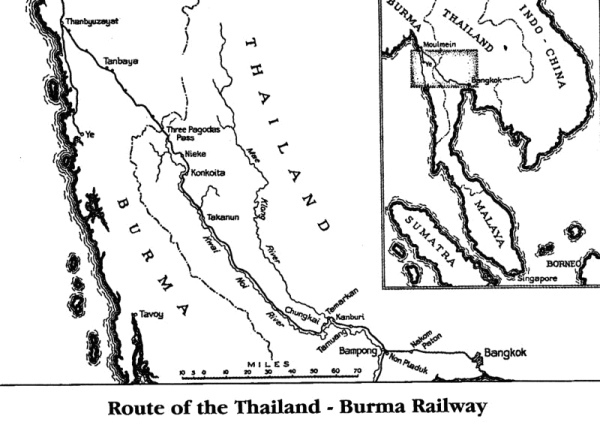 To construct the railway, a number of camps were established along the route from Thailand to Burma. Many of these camps were for prisoner of war units, whilst a separate series of camps were established for the coolies. Each of the prisoner of war camps usually had some form of medical establishment which was based upon a military structure, so that attempts could be made to enforce the most basic forms of hygiene. This was often extremely difficult given the conditions. 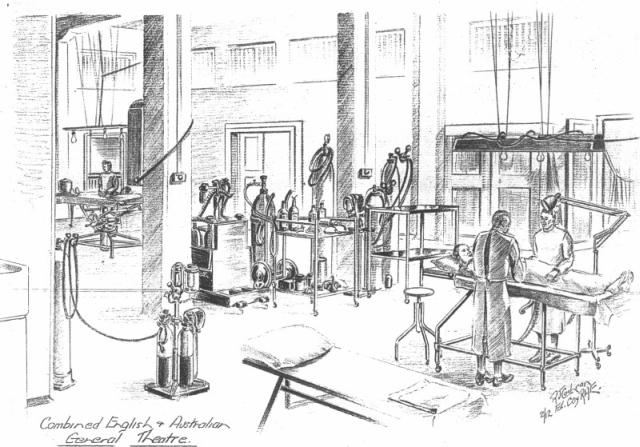 Medical facilities were generally very primitive and the necessary medical equipment often had to be hand made. Food was generally in short supply and usually based upon poor quality rice. Following experience in Singapore, extra necessary food supplements were often found by local purchase; even then there were many cases of disease which could be attributed to malnutrition. In the coolie camps, conditions were quite different as the coolies came onto the railway with no organisational structure, whilst the Japanese seemed to adopt a policy of doing nothing and tended to regard the coolies as expendable items. To complement the field medical teams, some base hospitals were established for the prisoners and also some facilities for the coolies. By May 1943, the Japanese realised that the wastage in the coolie camps was so high that they instructed the Prisoner of War Command in Changi to provide medical parties to proceed to Thailand. They were not really specific on what their function was, all they indicated was that the party was to be called "K Force". It was to remain under the general administration of Singapore; it was to be employed in the treatment of sick Prisoners of War and was to be divided into sections on arrival at its destination to staff already established hospitals. The Japanese also said that no medical supplies were to be taken, as adequate supplies were available in the hospitals. The Prisoner of War command heard from their own sources in Thailand that cholera, dysentery and malaria were prevalent in Thailand, so that quantities of appropriate drugs were taken by K Force. 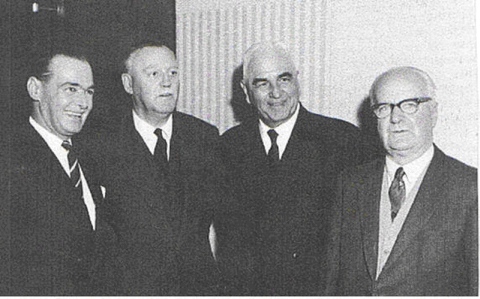 Lieutenant Colonel Glyn White, who was the chief Australian Medical Officer, asked Tim Hogg to join K Force. The Force in all totalled thirty medical officers and two hundred orderlies, of which there were five Australian medical officers' and fifty medical orderlies. The Force left Changi for Thailand on 25 June 1943 in closed steel rice trucks, 24 to 28 per truck, plus a Japanese sentry. The rail journey took eight days from Singapore to Kamburi in Thailand. Rations on the journey were very poor with two meals of rice and stew per day, They had very little drinking water and no ablution facilities. They were able to make local purchases of food en route at various stations. When they arrived at Kamburi, they were marched to the Japanese Headquarters where they were searched and all bulk medical supplies, Red Cross food parcels and reserve rations were confiscated; fortunately, many of the medical supplies had been distributed among all members of the force so that they were able to retain some quinine, atebrin and sulphanilamide tablets. They then had an address from Colonel Hayakawa who commanded the Sanitary Corps of the Bangkok to Moulmein Railway Construction Group. Colonel Hayakawa was responsible for the medical, hygiene and sanitation services along the line. He delivered a speech to the effect that all the great engineering achievement of the world had been carried out in the face of tremendous medical problems; success or failure depended on the ability to cope with disease. Already, there had been much sickness on the railway and many deaths. He said that it was the duty of K Force to prevent this, but before they could carry out this work he had to be satisfied that the medical party had sufficient knowledge. All officers were required to undertake a medical exam. Whilst the questions were simple, Tim felt that he could not answer them properly however he, like every one else (including two dentists) passed with flying colours. The members of K Force then realised that their real job was not to provide medical services to military personnel, but to provide medical services to the coolies. K Force was then divided into three groups, one party to remain at Kamburi where a new hospital was being set up, one party, including Tim Hogg was to go to Wanye, another party, including Jock Frew were to go to Nike. Prior to leaving Singapore, Tim, with foresight, asked his commanding officer, Lt Col Glyn White for enough spinal anaesthetic to last a couple of years. He was therefore able to operate during the next P.O.W. years. The Wanye party left Kamburi on 5 July in open trucks and bivouacked on an area in the rear of the local coolie camp which was heavily contaminated with human faeces. As the trucks were being loaded, Tim recorded that there were many Thai locals standing around quietly. As the trucks moved off, the Thai locals threw in bunches of bananas and then ran off. The P.O.W. 's were most grateful for the food. The Wanye party was then detailed for duty at various construction centres along the line. The various medical groups generally operated alone or with some other groups, from Kamburi through to Tanbaya which was 40 kilometres south of Moulmein in Burma. An additional Force was created from Singapore in August 1943, termed "L Force", this was similar to K Force, however it tended to be used in the base hospitals rather than in the field. Theoretically both K Force and L Force were under the command of Singapore, whilst most other Prisoner of War Forces were under the command of the Thailand Prisoner of War administration. The consequence of this was that those under local Thailand command received better consideration in all matters of supply, rations, pay and mail. K Force personnel were dependent entirely upon themselves and on the Japanese controlling the various camps to which they were attached. The majority of the Force were assigned to coolie camps "to provide medical attention and supervise hygiene and sanitation in the camp". Rather than forming a hospital as they were told, Tim found himself looking after the coolies. When Weary Dunlop heard that Tim Hogg and others had come up to Thailand from Changi, he rather unfeelingly commented in his diary "They are all acting as MO's to the Tamil camps with little to do except to make hygiene rules and bury the dead. In companionship I suppose, nothing but the Nipponese - what a life!" Little did he seem to realise the most difficult conditions under which members of K Force had to work to provide even the most basic medical facilities. In general, the medical staff of K Force who worked up the line in the coolie camps, worked under far more trying conditions than any other medical staff in Burma and Thailand. For the first few months, they found that supplies of drugs were either nil or totally inadequate; diseases in virtually all forms was rife, particularly cholera, dysentery, malaria and tropical ulcers. Rations were very poor, including poor quality rice and dried fish. Within a few weeks vitamin deficiencies began to appear, particularly beri-beri consequent mainly from the lack of vitamin A. Essentially, all that Tim had to treat the coolies with was quinine for malaria, condies crystals (potassium permanganate) to treat tropical ulcers and rough bandages made from split bamboos, and boiled up old clothing removed from the dead. The Japanese engineers' attitude was that every man who could walk was to work on the railway and that no labour was available for normal camp duties such as hygiene work and hut building. The coolies themselves had little idea of sanitation, so that a typical coolie camp at this time consisted of tumble down shelters in a midst of mud, excreta and food refuse, all of this in the midst of heavy monsoon rain. Tim and the others had individual clothing problems as they had no replacement for their clothes which suffered hard wear, so for normal travelling between the various camps, he used a G-String instead of his shorts; on his arm, he wore a Red Cross sign (brassard). This proved valuable one day as he was walking along a road between the camps, and a car passed him with Japanese officers, they thought that he was trying to escape! He only convinced them by pointing to his Red Cross sign and showing them the contents of his rucksack. Food supply was always a problem and was not helped by the fact that food for the camps up the line in Thailand was generally supplied by barges on the river which unloaded at the various camps. What they found was that in the more distant camps, if they were to receive say six bags or rice, then much was stolen on the way so that very little was left for the most distant camps. Even given their lack of medical supplies, the members of K Force who were working in the Coolie camps did much to alleviate the suffering of the coolie by making the maximum use of anything available. They used bamboo for many purposes such as building, furnishing, eating utensils, bed pans, bowls, instruments etc. Wild spinach and other native shrubs were collected for use in the treatment of vitamin deficiency diseases. The medical officers supervised the creation of isolation areas and latrines and the provision of boiled water for the sick coolies. All this work was much appreciated by the coolies who looked after the men of K Force and showed great generosity with gifts of food etc. on a reciprocal basis. The members of K Force had very few medical instruments as most of these had been taken from them by the Japanese when they arrived at Kamburi. On one occasion, Tim was visiting an Australian camp where there was no medical officer and found a patient with an acute appendix which needed an operation; Tim did not have suitable instruments or gauze. There was a British camp close by which had just received a Red Cross parcel of medical equipment. The British Colonel in charge was quite willing to give Tim some of this equipment if he could get them past the guard. Tim took special precautions to wrap bandages and gauze around his body and to hide the instruments under cotton wool in his knapsack. The guards found some of the gauze and cotton wool and were annoyed with him, and as he left the camp, they trained their machine guns on him; eventually, he managed to get away from the camp with his extra equipment. When he got back to the Australian camp, he removed the appendix with the help of a Doctor Lewis. Despite the rather primitive operating conditions, the patient lived. Tim Hogg had his own personal health problems as he was exposed to so much in the way of serious disease; he said that he had virtually every tropical disease imaginable at one time or other. All of K Force suffered from malaria, most, including Tim, from dysentery, beri beri, dermatitis and many with tropical ulcers. At one time, Tim received a very badly infected finger which really required opening and draining; he did not have any surgical instruments and eventually found a British doctor who administered an anaesthetic and performed an emergency operation on the side of a road, which required him convalescing in a nearby Australian camp. Jock Frew (Captain - Post War Sir Jock Frew) who was a Victorian doctor in K Force was more fortunate than Tim as he was attached for about a year to a Japanese mobile bacteriological unit. Once when Tim was moving between the various coolie camps, he heard that Jock Frew was further up the river, but not too far away. They were able to meet a number of times by Tim swimming up the river; after they met a number of times, they felt that it was too risky to meet further in this way. Tim worked at a number of camps from Kamburi in Thailand right up the line to within a few miles of Moulmein in Burma. In September 1943, a sick camp was formed at Kamburi for men of F and H Forces. Tim then with orderlies from K and L Forces did much of the work in setting up this camp. The camp was formed to receive sick men arriving from the upper sections of the line. Many of the men arriving were in very bad condition and many of the medical officers and orderlies of these groups were sick and exhausted. K and L Force personnel under Tim's leadership took over the medical duties as far as possible and contributed a great deal towards the establishment of a satisfactory camp and medical services. Later, Tim worked in the Japanese laboratory at Kamburi doing routine bacteriological work for the various camps in the area, he also worked for short times in two Japanese 25 bed hospitals. The line itself was completed in mid October 1943 and the numbers for work on the line decreased significantly. There was also a change, in administration on the line from the very difficult and demanding Japanese construction engineers to the local Japanese Thailand administration. This did alleviate the food situation, but it was still very difficult for the various prisoners and coolies. 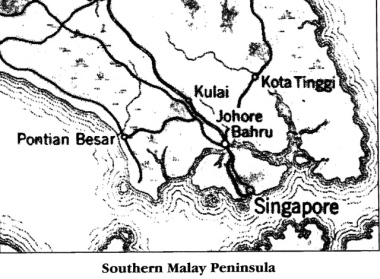 Many of the Australians working on the line had gradually been returned to Changi from the end of 1944 and early 1945; it had been intended that both K and L Forces should return at the end of December 1944 however, because of Allied air attacks on the bridges along the railway line, this did not take place. These air raids caused much trouble to the prisoners, not so much from the bombing, which was very accurate and avoided their camps, but from the consequential reduction in food supplies by the Japanese. There were a number of moves on K and L Force personnel during 1945 to various camps, the final move was to Takri which was 180 miles north of Bangkok on the Cheng Mai railway line. It took the 8 medical officers and 90 other ranks, five days to make the journey with about 1,000 other prisoners to reach the new site, where they found that the Japanese were constructing an air strip. On the way, Tim remembered that they slept in caves with many monkeys hopping about. As usual, they found that the accommodation and facilities were totally inadequate, with no hospital facilities, poor hygiene facilities and limited water supply. The area was highly malarious so that the sick wastage was very high. The medical staff had to build an operating theatre, dispensary and medical inspection block, together with a hospital block in addition to caring for 350 sick personnel plus 500 daily treatments at the medical inspection block. Tim carried a complete surgical kit to Takri as the surgical specialist in the party; upon his arrival, these were seized by the Japanese and despite protests these were never returned; an emergency set was created from the various instruments held privately by individual officers. Supplies of food and drugs became a major problem as much had to come from Bangkok and many bridges were destroyed by air attacks. This situation continued right up to the Japanese capitulation on 15 August 1945. Although the prisoners had stopped work, they were not told the reason by the Japanese. After a few days, the location of the Takri camp was found by the Allied forces and Tim remembered two British paratroopers walking into the camp saying, "Boys the war is over, you are free to disarm the Japs." After a few more days, whilst Tim was treating leg ulcers, an Australian Air Force officer came up from Bangkok. Tim knew him from Geelong College, it was Jos. Bell who had been Head Prefect. He collected the names of all personnel in the camp and ensured that the names were passed back to their respective countries saying that they were alive. Unfortunately, all the medical records of K Force were confiscated by the Japanese so that full details of their medical conditions were lost; it appears that the Japanese destroyed these along with most other K and L Force records. Takri received a number of ex prisoners from outlying camps, two of whom were found to have smallpox. The camp was then quarantined and although some evacuations had commenced, further evacuations were delayed for fourteen days. Finally, K Force was evacuated to Bangkok and effectively ceased to function as a medical unit as medical units from the incoming 7th Army in Burma took over responsibility. After his captivity, Tim weighed about seven stone. Throughout the time in Thailand all ranks of K Force behaved in an exemplary manner. It was anticipated that the long periods of isolation in coolie camps which many members experienced would have had an adverse effect on both discipline and enthusiasm for work. This was not so; when the Force came together again and had the opportunity of performing duties for which it was formed, it carried them out efficiently and willingly, even under the most adverse circumstances. Special mention should be made of the work performed by Captain T.C. Hogg and Captain J.L. Frew. Captain Hogg was surgical specialist in K Force and functioned in this capacity throughout the period when K and L Forces were together at Kamburi, Tamuan and Takri camp. Although experiencing indifferent health, his work often carried out under the most difficult conditions was outstanding. Although the Japanese had capitulated in mid August, it was some months before Tim actually was able to find a way back to Australia. Tim flew from Bangkok to Singapore and found that he could not obtain further clothing, also that he would have to queue for an aeroplane or go by boat to Australia. He chose the boat voyage in the British troopship Highland Brigade with a number of other ex prisoner of war medical officers and men, which departed Singapore on 6 October 1945. He arrived back in Perth where Major Jim Ainsley, who was chief surgeon in the Perth hospital, gave him an officer's tunic. He then returned to Melbourne, and Margaret and Nonee came to Menzies Hotel to meet him. Nonee waited upstairs and Margaret sat in the hall on a chair behind a pillar, where she could not see the door. She waited to be alerted by the doorman George, when Tim arrived because George knew him. After a few days, they took a plane to Tasmania where the children were waiting and he was finally discharged from the Army in Hobart 8 March 1946 after detailed medical examinations. Tim had lost 25 pounds weight since his initial medical examination in August 1941 and his medical examination in October 1945; taking into account the six weeks since his prisoner of war termination, he must have lost many more pounds during his life under the Japanese. I have been thinking of you very much of late. We have not heard anything of you since your postcard to Margaret written probably at the end of 1943. I often wonder whether I shall live to see you. If I do not I want to say something to you - how much I have loved you, what a joy you have been to me all your life, even from the days when I called you "Tiny Tim", and how proud I have been of you. You have been missed very much at your own home and here, while in the town many of your friends and patients all, always are asking about you. When you come back you will, I hope find Margaret and the children well. The children are dears, but they miss their father. Margaret looks after them well, altho' Johnie is inclined to be spoilt. When he goes to kindergarten he will improve. Let me impress on you the need to look after their education - in the new Age which is coming this is all important. See that they have the very best. This will be more valuable than any money they may inherit. For heavens sake do not let them grow up uneducated, uncultured boors like so many here. Gustave did see Tim some months after the letter was written. He died in 1950, about two years after his brother William. When Tim enlisted in the Australian Imperial Forces in August 1941, his wife Margaret was aged 30 and there were three children, Susanna (Suie) age just five years, Jenny age almost three and John age three days. Harry Gillett Snr. swamped Margaret's room at the Queen Victoria Hospital with roses for the birth, so that it was very difficult to even get through the door. It must have been very hard for Margaret, with three very young children to look after and having her husband reported missing believed dead. She only received some information that he was alive, eight months later in early 1943, then having no further knowledge until the Japanese capitulation in mid 1945. The rest of the family back in Launceston heard that he would be arriving by plane from Melbourne and they were driven out to the Western junction airport of Launceston numerous times during the day, as the plane was delayed by fog. When he did arrive, he seemed very tall, thin and yellow to the children. Jenny and Susanna remembered their father, but to John he was a stranger. Tim suffered badly from his prisoner of war experiences. Besides the traumas of the Burma Railway and looking after the coolies, he had had malaria, dengue fever, bacillary dysentery, catarrhal jaundice, beri-beri together with many other tropical complaints. By January 1946, he was breathless on the slightest exertion, slept poorly, tired quickly at the end of the day and had a slightly enlarged liver. By 1952, he still suffered from his war experiences, he still tired badly at the end of the day, slept poorly and had a poor digestive system. 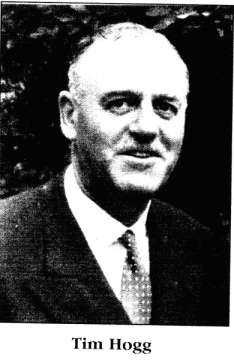 From 1946 to 1948, Tim Hogg was Surgical Registrar at the Launceston General Hospital, later becoming full time Orthopaedic Surgeon at the hospital in 1950, until his retirement at age 65 in 1971. During his work at the hospital, Tim acted as General Superintendent on a number of occasions and clinical superintendent, and even acted in these positions after his retirement. He received his Fellowship in Orthopaedics from the Royal Australasian College of Surgeons F.R.A.C.S. (Orthopaedics). Outside the hospital, Tim Hogg was a member of the Medical Council of Tasmania from 1952 to 1976, a member of the State Committee of the Fair bridge Society from 1953 to 1976; Honorary Surgeon to the Tasmanian Turf Club; Honorary Surgeon to the Launceston Branch of Disabled Persons; Honorary Orthopaedic Surgeon to the Society for Care of Crippled Children from 1953 to 1971 and Vice President from 1956 to 1977. He was President of the Caledonian Pipe Band from 1951 to 1962 and Patron from 1962 until his death. Tim Hogg received the Order of Australia (A.M.) on 26 January 1979 for service to handicapped children. Tim Hogg died on 2 May 1995, age 88 years. Readers may like to read other accounts of the medical personnel who laboured as members of "K" and "L" Force on the Burma Thailand Railway. Look in the articles section under "K and L Force sent to Thailand". Therein are also other short articles which relate to Tim Hogg. Much of this material was provided by one of his former Medical Orderlies Arthur Lawlor and by Mrs Joan Cussen (the widow of Robert Cussen), who after Robert's death devoted much time and effort in assembling material about the Medical support to the coolies..